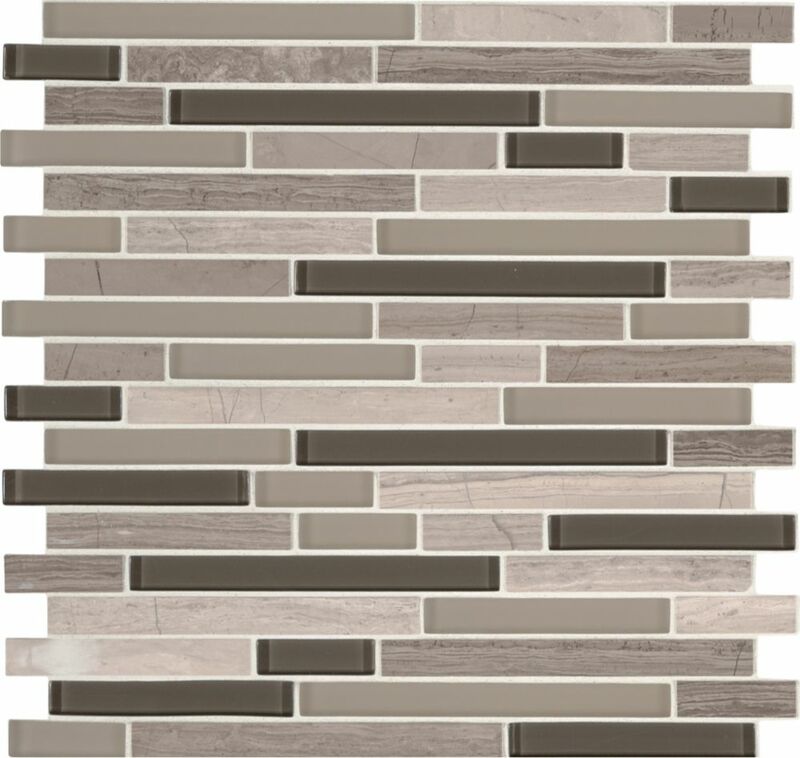 Add a splash of modern styling to your decor with Modello Grigio Interlocking Mosaic Tile. A seemingly random blend of gray stone and variably finished glass forms this 12 inch x 12 inch mesh-mounted tile, infusing your space with a chic look and a contemporary ambience. The mixed-sheen, mixed-finished tiles will invigorate any residential or commercial setting and are versatile enough to be used outside or on a fireplace surround. They look particularly ravishing as kitchen backsplash or bath wall and also work stunningly as a countertop surface or feature wall. Enjoy the soothing aesthetic of a reflecting pool with the Merola Tile Claude Mirror Penny Round 11-1/4-inch x 12-inch x 6 mm Glass Mosaic Tile. This unglazed, smooth mosaic is comprised of 7/8 in. translucent black glass tiles with a reflective, semi-transparent blue-gray top coating that changes in appearance based on the light conditions in your living space. An impervious water absorption rating makes this tile a great choice for installation on indoor and outdoor walls and backsplashes. The Merola Tile Pebble Green Moss 11-inch x 11-inch x 6 mm Porcelain Mosaic Tile incorporates organic shapes and randomly sized pebble-shaped tiles to create an exciting aesthetic touch. This nature-inspired tile features a glazed surface and comes in a pale, moss-green color with random bursts of warm and cool earth tones to create a look that complements a variety of design schemes. The strong mesh backing material makes for easy installation and the durable porcelain material and impervious water absorption rating make this tile a great choice for indoor and outdoor applications. Dorado River Rock Mesh-Mounted Mosaic is a Natural Stone Marble. This tile has random pieces of flat tumbled rock, mounted on a 12 in. x 12 in. mesh sheet for ease of installation. A blend of elegant white colour shades make it an attractive option to complement any install in a wide variety of design schemes, including kitchens and bathrooms. Note: Inspect all tiles before installation. Natural stone products inherently lack uniformity and are subject to variation in colour, shade, finish, etc. It is recommended to blend tiles from different boxes when installing. Natural stones may be characterized by dry seams and pits that are often filled. The filling can work its way out and it may be necessary to refill these voids as part of a normal maintenance procedure. All natural stone products should be sealed with a penetrating sealer. Modello Grigio Interlocking 12-inch x 12-inch x 6 mm Glass Stone Mesh-Mounted Mosaic Tile Add a splash of modern styling to your decor with Modello Grigio Interlocking Mosaic Tile. A seemingly random blend of gray stone and variably finished glass forms this 12 inch x 12 inch mesh-mounted tile, infusing your space with a chic look and a contemporary ambience. The mixed-sheen, mixed-finished tiles will invigorate any residential or commercial setting and are versatile enough to be used outside or on a fireplace surround. They look particularly ravishing as kitchen backsplash or bath wall and also work stunningly as a countertop surface or feature wall. Modello Grigio Interlocking 12-inch x 12-inch x 6 mm Glass Stone Mesh-Mounted Mosaic Tile is rated 4.8 out of 5 by 55. Rated 5 out of 5 by DeborahI from Good price compared to other mosaic tiles we looked at. Used as an accent band in a tub/shower c... Good price compared to other mosaic tiles we looked at. Used as an accent band in a tub/shower combo. Looks beautiful with the calacutta gold tile used on the rest of the shower surround and floor. Easy to divide in half to make the 6 inch accent band. Very happy with the look.